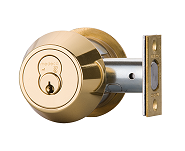 Available in either a traditional commercial style, or with refined residential sophistication, the security of a Maxum deadbolt incorporates flawlessly into any home or business. And, with a broad range of finishes, Maxum will match most standard finishes as a seamless upgrade to existing hardware, or provide the perfect first impression for new installations. You get Medeco protection on the outside, with an easy-to-turn thumbturn inside. Best for doors with windows and for businesses where no one could get locked inside. The key must be used to unlock the deadbolt when entering, or for locking when exiting, which provides the highest level of security. 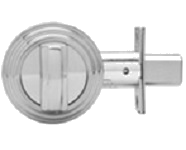 The special removable thumbturn key combines the advantages of single and double cylinder deadbolts. It allows easy exit in emergencies, but can be removed for additional burglary protection when away. The Medeco® Maxum Residential deadbolt offers commercial grade 1 Security in an aesthetically pleasing package.